What is life if not a juggling act, a dance, a frenetic shimmy here, and languorous glide there? We try to keep pace, keep as much balls in the air as we can. We’re not happy unless our agendas are filled to the brim, including margins and side notes….only to moan and cry as we struggle to check each task off. When did “busy” and “stressed” become status symbols? Not everyone is like this. Oh no. There are brilliant people who know the real score and smile gently in the background as we do our frantic dance, racing to somewhere nameless with only the stubborn knowledge that we must race there, ideally with a hundred balls in the air and oh the chiding if we let one slip. These people have got it all figured out. I still throw myself onto the hamster-wheel, running pell-mell into nowhere. I still grab much too many balls and then sigh about having to keep them all sailing smoothly. I’m learning that I can set the pace at which I dance. I can choose the music and the steps too. I can choose how many balls I want to juggle, and which I can leave behind for others. I’m learning that all dancers have breaks and so should I. That doing nothing sometimes has its own purpose (my strong predisposition for “me-time” helps me along). That sometimes it is not life that is complicated, but we that make it so. – Cut the chicken fillets into 1-2 inch chunks. Mix with egg white, salt, and 2 teaspoons cornstarch and let this marinate for 1 hour. – Mix Shaoxing wine, soy sauce, black vinegar, water, sugar, 1 teaspoon cornstarch, and sesame oil together and set aside. – Heat oil in a wok or skillet. Fry chicken until about 60% done (you will finish cooking it later). Drain and set aside. – Drain pan leaving only about 2 tablespoons of oil. Add the dried chillies and garlic and stir fry until chillies are toasted (slightly burnt is the original directive). Return chicken to the wok and fry. Add the sauce and cook further. Add peanuts and ground Sichuan pepper and toss until everything is well coated and the sauce is sticky. I have taken liberties with the original recipe and have adjusted some things to suit what is easily available for me. The original called for caltrop starch which I have not the foggiest clue where to find, so I substituted it with cornstarch. The original also indicated Zhenjiang vinegar, which is likewise unavailable (if anyone has a supplier in Manila let me know!) so I used regular Chinese black vinegar instead. I found this recipe in a old cookbook my godfather and his wife gave me. They live in Hong Kong and had attended a function of the chef/author (who has a restaurant in Singapore). His name is Jacky Yu and I know nothing about him except that he looks young and happy, his cookbook is half in Chinese, and that I love his stir fried chicken with chillies. And that’s enough for me. In my kitchen I dictate how complicated or simple I want things to be. That dish looks mighty scrumptious! I am a sucker fro chillies, dried or fresh. Your writing style is phenomenal. I enjoyed the intro to the recipe as much as, if not more than the recipe. I love how you always pair your recipe posts with your input about life. Both feed me. Your recipes feed my tummy, and your words feed me heart. I know I'm being a bit dramatic, but it's true and I wanted you to know it. And yes, I moved my blog again! LOL! Hi Rosa! We love chillies here too! Hi Anh! Happy you enjoyed the post 🙂 Hope you enjoy the chicken too! It looks delicious; very much like a dish I made the other night from Jason Harper's hilarious cookbook, Chinese Cuisine 101. I could eat this dish nearly every night. "I am learning that I can choose the pace at which I dance" – WINNER!!! This dish looks easy and definitely worth trying! Hi Chocolate Covered Kitchen! 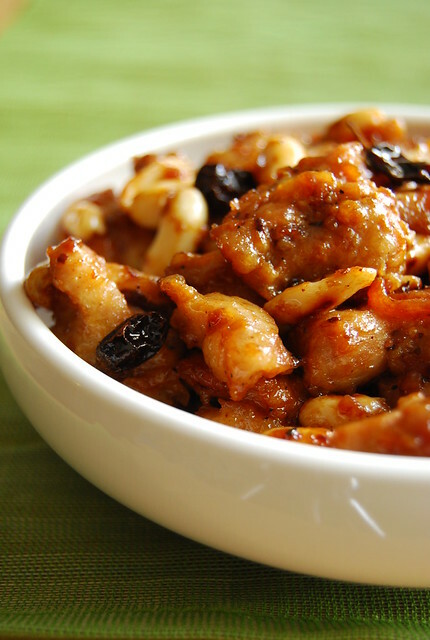 Me too, I love those Chinese-style chicken dishes that are sticky, spicy, with a touch of sweetness…mmm! Aw Anne! Thank you 🙂 I am a fan of your gorgeous and whimsical cakes!! Hi, Joey. I confess that I was one of those people who would keep her agenda brim-full of things to do. I also admit to the mad, bad practice of multitasking at work – and all it got me was a serious case of burnout that I am still recovering from to this day. I think that learning how to bake bread has been helping me recover. It has taught me that the best things in life take time; they need a great deal of patience and that rushing things will only lead to disappointment and heartache. Zhenjiang vinegar is a sweet vinegar, just cook normal black vinegar with some rock sugar til it has a slightly thicker texture. Good luck !